Sigh. It's coming up on summer. 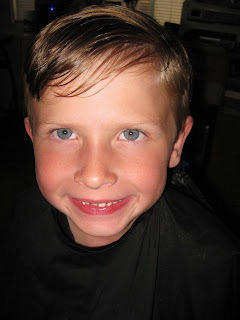 Michael likes the boys to have shorter hair (he is, after all, the one who does most of the shampooing around here). I love, love, love it when the boys have longer hair. Especially Nathan. Which is a complete surprise as I always thought I'd be dressing the boys in polos and knickers with Army cuts. Instead they wear holey denim, band tees, and have long locks, which I think suits them just fine. Go figure. Anyway, Ben was the sacrificial lamb and he got the short 'do this time around. 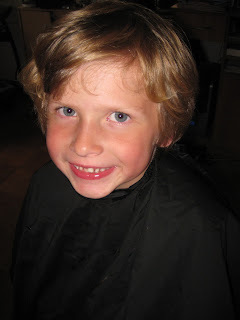 I spent about 20 minutes cutting Nathan's hair as well, just to make it look a little less shaggy. In the end, he couldn't tell that I'd done anything at all, which is fine with me (and him, he likes it long, too).